SEATTLE, Washington, March 10, 2011 (ENS) – Clean air advocates filed a lawsuit today in U.S. District Court in Seattle to require five oil refineries in the state to improve energy efficiency and take other steps to reduce their greenhouse gas emissions. The plaintiff groups, Sierra Club and Washington Environmental Council, are suing state and regional permitting agencies to force them to control greenhouse gas emissions from all five oil refineries in the state, as required by the federal Clean Air Act. The five refineries are BP Cherry Point in Blaine, ConocoPhillips in Ferndale, Shell Oil in Anacortes, Tesoro in Anacortes and U.S. Oil in Tacoma. Together Washington refineries account for an estimated eight percent of the state’s global warming pollution, making the sector one of the largest single contributors of greenhouse gas emissions in Washington. The oil refineries also emit methane and nitrous oxide, which are more potent greenhouse gases than carbon dioxide, as well as several other air contaminants that pose risks to human health and the environment such as hydrogen sulfide, sulfur dioxide, nitrogen oxides, particulate matter, and volatile organic compounds. Four of the five refineries are operating under expired Clean Air Act permits, the plaintiff groups point out. The suit names E.G. “Ted” Sturdevant, director of the Washington State Department of Ecology, Mark Asmundson, director of the Northwest Clean Air Agency, and Craig T. Kenworthy, director of the Puget Sound Clean Air Agency as defendants in the case. State and regional permitting agencies are mandated to require reasonably available control technology, RACT, for all air contaminants from the refineries. 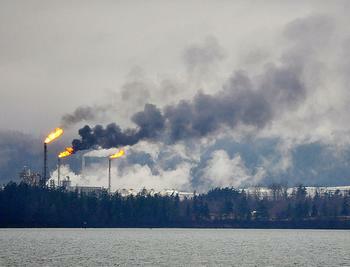 The agencies failed to apply RACT for greenhouse gas emissions at all of Washington’s refineries. The plaintiff groups sent notice of this failure last summer, expressing intent to pursue a lawsuit, if necessary, “to protect children, property and business owners and the natural environment” from the oil refineries’ pollution. The oil refineries burn fossil fuels in the process of converting crude oil into usable products such as gasoline, jet fuel, and asphalt. As a result of this combustion and the refining process, the oil refineries emit greenhouse gases from their process heaters, boilers, fluid catalytic cracking units, hydrogen production units, sulfur recovery plants, and other facilities and units at the refineries. The groups cite a U.S. Environmental Protection Agency report detailing numerous efficiency improvements for reducing greenhouse gas emissions from oil refineries, including boiler and steam system optimization, efficiency improvements in process heaters and motors, and waste gas and power recovery. None of Washington’s oil refineries are currently Energy Star certified, indicating that there are significant opportunities for improvement at each of them, the groups say.